This was a tough week. In terms of school it is a tough time of year because the calendar is not our friend. Both teachers and students are suffering from fatigue. After all we have been in school for a very long time. Yet, in Texas we have our heaviest round of standardized testing this coming week and for elementary music teachers at schools like mine that means that we are gearing up for our heaviest performance season all year….. the month of May. When you take an already tough week and add the national tragedies we’ve experienced this week it means that at least for me, this has been one of my most challenging weeks ever. I didn’t have any “extra” work this week, but I admit that doing an ordinary days work took a whole lot of extra ordinary effort. I would come home and watch the news, sleep fitfully and then start over. Imagine my surprise when I also had two totally unrelated truths that I’ve discovered about how I want to be as a teacher that I wanted to take the time to capture here. Choice is a powerful motivator, I just have to learn to stack the deck in my favor without revealing my hand. In other words you can sink or sail your ship by the way you turn a phrase. At this time of year even students who are ready and prepared for learning can become hesitant and reluctant. At the same time, students who often need lots of extra support and discipline to stay involved are not responding any longer to the structures, encouragements and consequences that have kept them on track all year. Consequently, I am the only one who can guide my students past their reluctance and in some cases tendency toward active sabotage toward an engaging lesson that is worth their time and effort. When “that” class came in…. you know the one…. the one that makes you work harder than all the others combined?….. I was ready……My objective never changed, but my delivery did. I introduced what was in my mind the “consequence” assignment as an ordinary assignment with equal weight and validity as the “better choice” assignment. I spoke of both with equal sincerity and mild enthusiasm so that my students were convinced that both were true options for their choice. I ended up with the entire class on board with the more active of the two lessons without any fuss. This was much more effective than introducing my choice of an assignment followed by a curt impatient description of an alternate punitive assignment for those students who failed to agree with my choice. I think it worked because I surprised my students. I think it worked because it disarmed students who enjoy being the squeaky wheel. I think it worked because I was fully set up for both options. The benefit was that we had a good class and no one sabotaged the work because in their minds they got to choose. 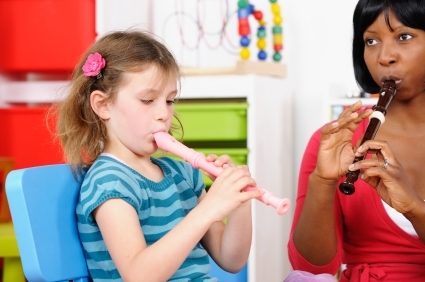 By the time my students leave the 5th grade, I want them to feel successful on recorder whether it takes two years, a pair of headphones and a patient partner or whether it takes five minutes in the hallway on the way to class after breakfast. In other words spiraling the musical experiences I provide for my students provides an avenue for growth over time. One of my more sensitive students has a particular aversion to the sound a recorder makes. When we began recorder in fourth grade he had a terrible time trying to stay in my room. He was fine until recorders started and then he would escape the noise by visiting the art room. Since he was otherwise engaged in music, I let him demonstrate mastery in other ways. We continued with recorder throughout 4th grade and now here we are in the second half of April at the end of 5th grade and without any invitation from me, but because his buddy from class invited him to, he has earned his white belt on recorder!!!!! Also today, I had a 5th grader arrive who had never even held a recorder before ( that’s what happens when you move schools often.) Five minutes in the hallway after breakfast and he already has his first belt. I’m so glad that I decided to stretch our recorder experiences over time so that my students could catch more music with their “learning nets”. At schools like this one with high mobility rates, providing a solitary experiences or even isolated units of study will miss lots and lots of students. It’s better to provide spiraled experiences where you can revisit and deepen some things from weeks, months and years before. As I’ve been planning for next year I’ve been reflecting the effectiveness of how I use the recorder and after these two unrelated experiences I can say that I am happy with the outcomes and find the extra time worth the effort.